← Learning is a process. I was back in the saddle today, after a four day hiatus due to a business trip and subzero weather. As I noted in my last post, I need to re-establish forward, and get Mads back in front of my leg. 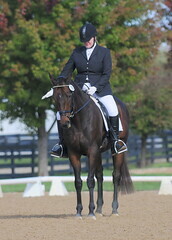 At the same time, I need to work on fixing the crookedness that is causing me to hang on that left rein. Except, maybe I shouldn’t work on the two at the same time. Today’s ride was a bit ugly, because what I got was some nice forward work — and ugly resistance, as Mads braced her neck and popped her right shoulder out. I did a couple laps to the left, softening and releasing my left rein, and she softened nicely into my outside rein. Which I made a point of holding. But when we went back to doing circles and figure-8s, I had trouble with the steering (!) and, over all, she was resistant to the left. However, the quality of our work improved when we did serpentines. So, if I get to ride tomorrow (which is iffy) I’m thinking that more work in serpentines would be good – at least as we warm up. And, I think it’s time to put the spurs back on, now that my leg position is better. I need to add emphasis to my leg aids. However, I need to keep insisting upon responsiveness too. The last thing I want is a horse that is dead to the leg. The good news is that Mads was nicely forward, though we still don’t have the quality trot we were generating before the holidays. This nice trot is still eluding us, but we're working toward it. In addition to the hanging issues, and the forward issues, I’m dumping Maddie onto her forehand. So, half-halts need to be a bigger part of my repertoire. 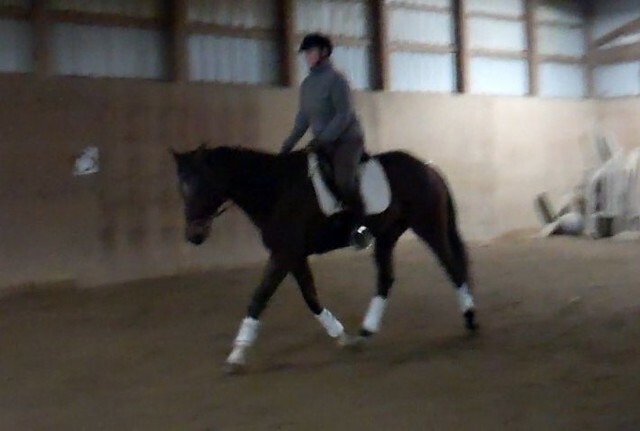 I’m good about half-halting as we head into a corner, or asking her for a shorter, “smaller” gait on the short side, but I am not using them enough at other times, to engage her back end and invite her to lift her shoulders, producing the pretty, uphill gait pictured above. So I need to get better at multi-tasking in the saddle. This is always hard for me when I’m not fully proficient with a skill. Feeling what’s going on underneath me, and responding in the moment — and appropriately — is hard. But that’s dressage.